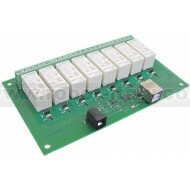 The USB-RLY16 provides eight volt free contact relay outputs with a current rating of up to 16Amp each. The processor is powered and instructed from any standard USB bus and the relay power is obtained by the DC power input adaptor. The DC input jack is 2.1mm with positive core polarity, DC supplies are required to supply at least 500mA at 12vdc. The USB-RLY16 module uses the FTDI FT232R USB chip to handle all the USB protocols. The documentation provided by FTDI is very complete, and is not duplicated here. Before using the USB-RLY16, you will need to install FTDI's Virtual COM Port ( VCP ) Drivers. These drivers appear to the system as an extra Com Port ( in addition to any existing hardware Com Ports ). Application software accesses the USB device in the same way as it would access a standard Windows Com Port using the Windows VCOMM API calls or by using a Com Port Library. Drivers are available for Windows, Apple, Linux and Open BSD systems directly from the FTDI website. You should get and install the drivers now, before you connect the USB-RLY16 to your computer. The Drivers page is here. After installing the drivers, and plugging in the USB-RLY16 module to a spare USB port, you will want to know which COM port it has been assigned to. This will vary from system to system depending on how many COM ports you currently have installed. To find out where it is, right click on your "My Computer" desktop icon and select the "Device Manager" tab. Now scroll down and open the "Ports (COM & LPT)" tab. You should see the USB serial port listed - COM2 in the example below. If you want to change the COM port number - just right click on it, select properties, select advanced and select the COM port number from the available list. The COM port should be set up for 19200 baud, 8 data bits, no parity and two stop bits. The USB-RLY16 operates with an easy to use command set as described in the table below. Most commands are only a single byte and if applicable the USB-RLY16 will automatically send its response. The only exception to this being the "Set relay states" command which requires and additional desired states byte to be sent immediately after the command byte. To get the USB-RLY16 up and running in the minimum amount of time we have put together an example program to demonstrate the functionality of the module. The test program is available as a visual c# express built exe file here USB RLY16 TEST or as visual c# express project here USB-RLY16 TEST.zip. The test program is available as a visual basic express built exe file here USB RLY16VB or as visual basic express project here USB-RLY16VB.zip. Powered and Controlled from the USB bus. 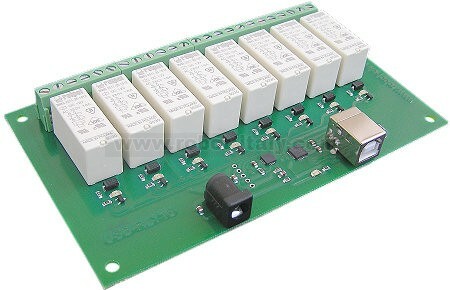 The relays used on this board are premium ultra low power 50mW coil types.